Mammalian antimicrobial proteins, such as defensins and cathelicidin, have stimulating effects on host leukocytes. Cathelin-related antimicrobial peptide (CRAMP), the orthologue of human cathelicidin/LL-37, is the sole identified murine cathelicidin. CRAMP has been shown to have both antimicrobial and angiogenic activities. However, whether CRAMP, like human cathelicidin/LL-37, also exhibits a direct effect on the migration and function of leukocytes is not known. We have observed that CRAMP, like LL-37, was chemotactic for human monocytes, neutrophils, macrophages, and mouse peripheral blood leukocytes. CRAMP also induced calcium mobilization and the activation of MAPK in monocytes. CRAMP-induced calcium flux in monocytes was desensitized by MMK-1, an agonistic ligand specific for formyl peptide receptor-like-1 (FPRL1), and vice versa, suggesting the use of FPRL1 by CRAMP as a receptor. Furthermore, CRAMP induced the chemotaxis of human embryonic kidney 293 cells transfected with either FPRL1 or mouse formyl peptide receptor-2, the mouse homologue of FPRL1, but not by untransfected parental human embryonic kidney 293 cells, confirming the use of FPRL1/mouse formyl peptide receptor-2 by CRAMP. Injection of CRAMP into mouse air pouches resulted in the recruitment predominantly of neutrophils and monocytes, indicating that CRAMP acts as a chemotactic factor in vivo. Finally, simultaneous administration of OVA with CRAMP to mice promoted both humoral and cellular Ag-specific immune responses. Thus, CRAMP functions as both a chemoattractant for phagocytic leukocytes and an enhancer of adaptive immune response. Antimicrobial proteins (AMPs)3 have direct antimicrobial activity against various microorganisms, including bacteria, fungi, certain parasites, and viruses, and are considered important effector molecules of innate immune defense (1, 2). Mammalian AMPs are largely represented by defensins and cathelicidins (1, 3, 4, 5, 6, 7). Cathelicidin defines a group of mammalian AMPs characterized by an N-terminal signal peptide (29–30 aa residues), a highly conserved cathelin-like propeptide (99–114 aa residues), and a structurally variable (12–100 aa residues) C-terminal microbicidal peptide (hence the term cathelicidin) (3). Cathelicidins have been identified in many mammalian species, and there is considerable interspecies variation in the number of homologues (3, 7). In humans, only one cathelicidin has been identified to date, which is termed human cationic antimicrobial protein of 18 kDa (hCAP18) (3, 7, 8, 9, 10). Cleavage of hCAP18 occurs between Ala103 and Leu104, giving rise to a 37-residue mature antimicrobial peptide with two leucine residues on its N terminus (hence the term LL-37) (11, 12). LL-37/hCAP18 is expressed by leukocytes, including neutrophils, monocytes, mast cells, NK cells, γδT cells, and B cells (9, 11, 13, 14, 15, 16). LL-37 has also been detected in plasma, in bone marrow, and on the surface of airway and skin (11, 13, 17, 18). LL-37 is antimicrobial (3, 7, 13, 19) and can neutralize LPS (3, 7, 8, 20, 21). In recent years, LL-37 has been found to activate mast cells, phagocytes, and epithelial and endothelial cells (21, 22, 23); to induce the chemotaxis of phagocytes, T cells, and mast cells (24, 25); and to participate in wound healing (18, 26). We and others have previously demonstrated that LL-37 uses human formyl peptide receptor-like 1 (FPRL1), a G protein-coupled, seven-transmembrane domain receptor (27), as the receptor to mediate its chemotactic and angiogenic effects (23, 24). In addition to LL-37, PR-39, a pig cathelicidin, has been shown to chemoattract and activate neutrophils (28). ProBac7, a bovine cathelicidin, is reported to be chemotactic for monocytes/macrophages (29). In mice, one cathelicidin, termed cathelin-related antimicrobial peptide (CRAMP), has been identified (30). Similar to LL-37, CRAMP has an α-helical structure (31), is antimicrobial in vitro and in vivo (18, 30, 32), and is angiogenic (23). However, whether CRAMP, similar to LL-37, also has direct effect on leukocytes is not known. In the present study we investigated the effect of CRAMP on both human and mouse leukocytes, particularly phagocytes, and found that CRAMP acted as a chemoattractant for leukocytes both in vitro and in vivo. In addition, we identified the receptor that CRAMP uses to mediate its effect on leukocytes. Furthermore, using OVA as an experimental Ag, we demonstrated that CRAMP has the capacity to enhance OVA-specific humoral and cellular immune responses when they were administered simultaneously, providing evidence to support the idea that vertebrate AMPs, including cathelicidins, can act as alarmins in response to danger signals and contribute to both innate and adaptive antimicrobial immunity of the host. RPMI 1640 and DMEM were purchased from BioWhittaker. FBS was purchased from HyClone. Recombinant human GM-CSF (rhGM-CSF), IL-4 (rhIL-4), and macrophage-CSF (rhM-CSF) were purchased from PeproTech. Pertussis toxin (PTX) and fMLP were purchased from Sigma-Aldrich. MMK-1, an FPRL1-specific ligand of 13 amino acids (LESIFRSLLFRVM) (33), and W peptide, a chemotactic hexapeptide (WKYMVm, m represents a d-Met residue) originally identified from a combinatorial peptide library (34) and later found to be an agonistic ligand for human formyl peptide receptor (FPR) (35), FPRL1 (35), and FPRL2 (36, 37), were synthesized and purified at Colorado State University (Fort Collins, CO). CRAMP (ISRLAGLLRKGGEKIGEKLKKIGQKIKNFFQKLVPQPE) and LL-37 (LLGDFFRKSKEKIGKEFKRIVQRIKDFLRNLVPRTES) were synthesized by solid phase F-moc chemistry and purified to >95% by reverse phase HPLC and electrospray ionization mass spectrometry analysis (Global Peptide Services). Human PBMCs were isolated by Ficoll-Paque density gradient centrifugation from leukopacks supplied by the Department of Transfusion Medicine, Clinical Center of National Institutes of Health. Monocytes were purified (>95%) from PBMC using a MACS CD14 monocyte isolation kit (Miltenyi Biotec). Human neutrophils were isolated and purified to >99% as described previously (38). Mouse PBL were isolated from mouse peripheral blood by hemolysis with ACK lysing buffer (Quality Biological). The generation of monocyte-derived macrophages and immature dendritic cells (iDCs) was conducted as described previously (39, 40). In brief, human monocyte-derived macrophages were generated by incubated purified monocytes at 1 × 106/ml in RPMI 1640 medium (RPMI 1640 containing 10% FBS, 2 mM glutamine, 25 mM HEPES, 100 U/ml penicillin, and 100 μg/ml streptomycin) in the presence of 50 ng/ml rhM-CSF at 37°C in a humidified CO2 (5%) incubator for 7 days. For the generation of iDCs, purified human monocytes were incubated at 1 × 106/ml in RPMI 1640 medium in the presence of 50 ng/ml rhGM-CSF and 50 ng/ml rhIL-4 at 37°C in a humidified CO2 (5%) incubator for 7 days. During the culture period, half the culture medium was replaced every 2–3 days. Human embryonic kidney 293 (HEK293) cells stably expressing human FPRL1 (HEK293/FPRL1) or mouse formyl peptide receptor 2 (HEK293/mFPR2) were obtained from Dr. J. M. Wang (National Cancer Institute, Frederick, MD), which were originally gifts from Drs. P. M. Murphy and J.-L. Gao (National Institute of Allergy and Infectious Diseases, National Institutes of Health, Bethesda, MD). The parental HEK293 cells were maintained in complete DMEM (DMEM containing 10% FBS, 2 mM glutamine, 25 mM HEPES, 100 U/ml penicillin, and 100 μg/ml streptomycin). Both FPRL1/HEK293 and mFPR2/HEK293 cells were maintained in complete DMEM in the presence of 1 mg/ml G418 (Invitrogen Life Technologies). Cell migration was assessed using a 48-well microchemotaxis chamber (NeuroProbe) as previously described (24, 39, 40). Briefly, various test factors diluted with chemotaxis medium (RPMI 1640 containing 1% BSA) were placed in the lower wells of the chamber, and the cells suspended in chemotaxis medium were added to wells of the upper compartment. The lower and upper compartments were separated by a piece of 5-μm pore size polycarbonate filter (NeuroProbe). For evaluating the migration of HEK293 cells, 10-μm pore size polycarbonate filters were coated at 37°C for 2 h with type 1 rat tail collagen (BD Biosciences) at a final concentration of 50 μg/ml, air-dried, and used. In some experiments, monocytes were pretreated for 1 h at 37°C in the absence or the presence of PTX (final concentration, 200 ng/ml) before use. For checkerboard analysis, CRAMP was simultaneously added to wells of the upper compartment. Incubation time varied depending on target cells (60 min for human neutrophils; 90 min for human monocytes, DCs, macrophages, and mouse PBLs; 300 min for HEK293 cells). After incubation, the filters were removed, scraped, and stained, and the number of cells migrating across the filter was counted using a BioQuant semiautomatic counting system (which objectively determines the average cell number of six defined microscopic fields) and presented as the number of cells per high power field. Monocytes were loaded by incubation with 5 μM fura 2 (Molecular Probes) at room temperature for 30 min in the dark. Subsequently, the cells were washed and resuspended at 1 × 106/ml in saline buffer (138 mM NaCl, 6 mM KCl, 1 mM CaCl2, 10 mM HEPES, 5 mM glucose, and 1% BSA, pH 7.4). Each 2 ml of loaded monocytes were transferred into a quartz cuvette, which was placed in a luminescence spectrometer (LS-50B; PerkinElmer). Calcium flux of the cells in response to chemotactic factors was measured by recording the ratio of fluorescence emitted at 510 nm after sequential excitation at 340 and 380 nm. Mouse PBLs and human PBMCs were washed three times with PBS and suspended in serum-free RPMI 1640. Cells (2 × 106/sample) were incubated at 37°C in the absence or the presence of the indicated concentrations of CRAMP for the specified period of time. At the end of the incubation, stimulation was immediately stopped by addition of large amount of ice-cold PBS (10-fold). The cells were centrifuged at 150 × g for 5 min at 4°C, washed with cold PBS, and lysed by SDS sample buffer (62.5 mM Tris-HCl (pH 6.8) at 25°C, 2% (w/v) SDS, 10% glycerol, 50 mM DTT, and 0.01% bromphenol blue). The lysates were sonicated for 10 s to shear DNA, boiled for 10 min, and cooled on ice. The lysates were loaded (20 μl/lane) and separated on a 4–12% NuPAGE bis-Tris gel using 1× NuPAGE MES SDS Running Buffer as the electrode buffer. SeeBlue Plus2 (Invitrogen Life Technologies) was used as a molecular size marker. After electrophoresis, proteins in the gel were electrotransferred (25 V constant for 1 h) onto a piece of Immobilon membrane (Millipore) using 1× NuPAGE transfer buffer (12 mM Tris, 96 mM glycine (pH 8.3), 0.1% (v/v) antioxidant, and 10% (v/v) methanol). Phosphorylated MAPKs were detected by Western blotting as previously described (41). In brief, the membrane was sequentially washed, blocked for 1 h at room temperature, washed, and incubated at 4°C overnight in the presence of a 1/1000 dilution of rabbit anti-phospho-p44/42 Ab (Cell Signaling Technology). On the next day, the membrane was washed and incubated with 1/2000 dilution of HRP-conjugated anti-rabbit IgG (Cell Signaling Technology) for 1 h. After washing and incubation with a working solution of ECL Plus Western Blotting Detection System (Amersham Biosciences) for 5 min at room temperature, the membrane was exposed to BioMax x-ray film (Eastman Kodak). The x-ray film was developed using an automatic processor (Kodak X-OMAT 200A). The same membrane was stripped and probed for p44/42 protein essentially in the same manner, except using rabbit anti-p44/42 Ab (Cell Signaling Technology) as the primary Ab. All mice were obtained from the animal production facility of the National Cancer Institute at Frederick and maintained under specific pathogen-free conditions in the experimental animal facility at the National Cancer Institute at Frederick for several weeks to allow acclimation before the experiments. The animal studies were conducted in accordance with the principles and procedures outlined in the National Institutes of Health Guide for the Care and Use of Animals. Air pouches were raised on the dorsum of 6- to 8-wk-old BALB/c mice as described previously (41). Mice with a well-formed air pouch were randomized into groups. Each mouse was injected with 1 ml of endotoxin-free PBS alone or PBS containing 0.4, 2, or 10 μM CRAMP into the air pouches. Four hours later, the mice were killed by CO2 asphyxiation, and cells in the air pouches were washed out with 3 ml of endotoxin-free PBS containing 5 mM EDTA and 20 U/ml heparin and enumerated after trypan blue staining. Differential counting of leukocyte subpopulations migrating into the pouch space was performed after eosin-methylene blue staining of cytospins. Eight-week-old C57BL/6 mice were injected i.p. on day 1 with 0.2 ml of PBS containing 50 μg of OVA (Sigma-Aldrich) in the presence or the absence of CRAMP. Alum (Al(OH)3 gel; Sigma-Aldrich) was used as a positive control adjuvant. On day 14, all mice were booster-immunized by i.p. injection of 0.2 ml of PBS containing 50 μg of OVA. On days 10 and 21, blood samples were collected from each mouse by orbital bleeding. Serum was separated from each blood sample and used for measurement of the anti-OVA Ab titer. On day 21, all mice were euthanized, and their spleens were removed for the measurement of OVA-specific splenocyte proliferation and cytokine production. ELISA for the quantitation of total OVA-specific IgG in mouse serum was performed in the following steps with three to five washes in between steps. The solution used for dilution of samples and washing was PBS-containing 0.05% Tween 20 unless otherwise indicated. Step 1 involved coating 96-well ELISA plates and incubating cells with 10 μg/ml OVA in 0.05 M carbonate buffer (pH 9.5) at 4°C overnight. Step 2 consisted of blocking; the coated plates were incubated with PBS containing 1% skim milk for 1 h at 37°C. Step 3 involved reaction with samples or standard; serum samples or standard mouse anti-OVA IgG Ab (AntibodyShop) at various dilutions were added to wells of the coated plates that were subsequently incubated at 4°C overnight. In step 4, reaction with HRP-conjugated anti-mouse IgG was performed; HRP-conjugated goat anti-mouse IgG at the dilution of 1/1000 was added to wells of the plates and incubated for 1 h at 37°C. Step 5 involved reaction with HRP substrate and measurement of reaction product; 0.1 ml of 3,3′,5,5′-tetramethylbenzidine substrate solution (Amersham Biosciences) was added to each well of the plates, which were incubated at room temperature for 15 min before the addition of 0.1 ml of 2 N H2SO4 and subsequently were measured spectrophotometrically using a Bio-Tek ELISA reader at a wavelength of 450 nm with a reference wavelength of 630 nm. The concentration of OVA-specific IgG in serum samples was calculated based on the standard curve. The ELISA for measuring the subclass of OVA-specific IgG was performed similarly with minor modifications. After steps 1–3, 0.1 ml of diluted (1/1000) rabbit anti-mouse IgG1, IgG2a, IgG2b, or IgG3 (BD Pharmingen) was added to the plate and incubated at 4°C overnight before incubation with HRP-conjugated sheep anti-rabbit IgG. The level of anti-OVA IgG1, IgG2a, IgG2b, or IgG3 was illustrated as the reciprocal logarithmic value of the highest dilution that gave an absorbance ≥0.1 above the negative control value. RBC-depleted splenocytes (3 × 105 cells/well) from each mouse were cultured in 96-well, flat-bottom plates in a final volume of 0.2 ml of complete RPMI 1640 medium (RPMI 1640 supplemented with 5% FBS, 2 mM glutamine, 25 mM HEPES, 100 U/ml penicillin, 100 μg/ml streptomycin, and 50 μM 2-ME) in the presence of OVA at various concentrations for 72 h at 37°C in humidified air containing 5% CO2. To measure the proliferation of splenocytes, cultures were pulsed for 16 h with 0.5 μCi/well [3H]thymidine and harvested, and the radioactivity incorporated into cells was measured using a microbeta counter (PerkinElmer Wallac). To determine cytokine production, the culture supernatants were collected and measured using a SearchLight technique (Pierce), which has a lower detection limit of 0.8 pg/ml for IL-4, 5.5 pg/ml for IL-6, 1.6 pg/ml for IL-10, and 7.8 pg/ml for IFN-γ. First, we tested whether CRAMP could induce the migration of human PBMCs over a range of 16–10,000 nM using LL-37 as a positive control. As shown in Fig. 1⇓A, CRAMP induced monocyte migration in a dose-dependent manner. The peak response was observed at 400 nM. The synthesized CRAMP was >95% pure and had a mass identical with the calculated mass of CRAMP by mass spectrometry analysis (data not shown). To ensure that the monocyte-attracting activity of the CRAMP sample was not due to a potential nonpeptide contaminant, four aliquots of CRAMP sample were either treated or incubated for 30 min at 40°C in the absence or the presence of proteinase K or pronase and subsequently were diluted similarly and tested on monocytes isolated from the same donor. Digestion of CRAMP samples with either proteinase K or pronase almost completely abrogated the capacity of the CRAMP sample to induce the migration of human monocytes, indicating that the monocyte-attracting activity of the CRAMP sample was not due to a nonpeptide contaminant (Fig. 1⇓B). To address whether CRAMP-induced migration of human monocytes was due to chemotaxis or chemokinesis, checkerboard analysis was performed (Table I⇓). CRAMP, in a dose-dependent manner, induced the migration of human monocytes when added to the lower wells of the chemotaxis chamber. However, increasing concentrations of CRAMP added simultaneously with monocytes to the upper wells of the chamber abrogated monocyte migration induced by CRAMP in the lower wells. Thus, CRAMP-induced migration of monocytes was based on chemotaxis, rather than chemokinesis. CRAMP induction of human peripheral monocyte migration. 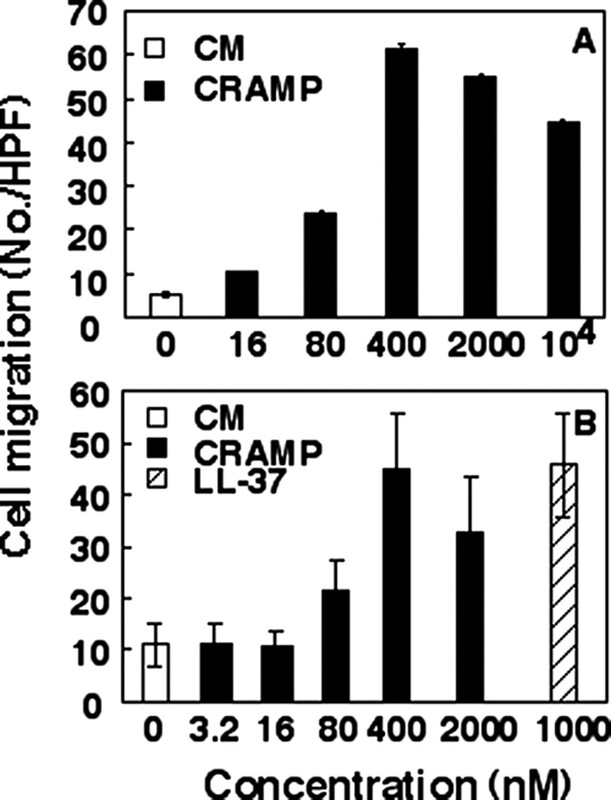 A, The migration of human monocytes in response to CRAMP or LL-37 was evaluated by chemotaxis assay. CM, chemotaxis medium. B, Effect of proteinase digestion on the monocyte-chemoattracting activity of CRAMP sample. Aliquots of 10 nmol of CRAMP were either put on ice or incubated at 40°C for 30 min in the absence or the presence of proteinase at 100 μg/ml. Subsequently, the capacity of the untreated or treated CRAMP aliquots to attract monocytes were tested by on monocytes isolated from the same donor. The results are shown as the average cell migration (mean ± SD) for triplicate wells. To investigate whether phagocytes other than monocytes could also respond to CRAMP, we tested whether neutrophils could be chemoattracted by CRAMP using fMLP as a positive control (Fig. 2⇓A). Similar to monocytes, human neutrophils migrated in response to CRAMP with a bell-shaped dose-response curve (Fig. 2⇓A), indicating that CRAMP is also an agonistic chemoattractant for human neutrophils. Next, we investigated whether CRAMP could induce the migration of mouse leukocytes. As shown in Fig. 2⇓B, CRAMP dose-dependently chemoattracted mouse PBLs. Consistent with the data showing that CRAMP could act on human phagocytes (Figs. 1⇑ and 2⇓A), LL-37 induced the migration of mouse PBLs (Fig. 2⇓B), suggesting that both human and mouse cathelicidins can act across the species barrier between humans and mice. CRAMP induction of chemotaxis of human neutrophils (A) and mouse PBLs (B). The results (the average cell migration (mean ± SD) of triplicate wells) of one representative of two experiments are shown. To determine whether CRAMP-induced leukocyte chemotaxis was mediated by a GiαPCR, we examined whether CRAMP-induced monocyte chemotaxis could be inhibited by PTX, a toxin that specifically inhibits GiαPCR signaling by ADP-ribosylating the Giα subunit of heterotrimeric G protein (42). Incubation of monocytes at 37°C for 30 min in the presence of PTX (200 ng/ml) before chemotaxis assay completely inhibited the migration of monocytes in response to CRAMP (Table II⇓). Pretreatment with PTX did not affect the absolute motility of monocytes, because there was no difference in spontaneous migration between PTX-pretreated and control monocytes. Furthermore, the inhibition was not due to the preincubation per se, because control incubation of monocytes in the absence of PTX did not inhibit migration in response to CRAMP. As expected, fMLP-induced monocyte migration was also greatly inhibited by PTX. Therefore, CRAMP-induced monocyte chemotaxis seems to be mediated by a GiαPCR. Interaction of a GiαPCR with its chemotactic agonistic ligands results in activation of MAPK in target cells (41, 43, 44). We investigated whether CRAMP could also induce the downstream activation of p44/42 MAPK in freshly isolated mouse PBLs by Western blotting (Fig. 3⇓). 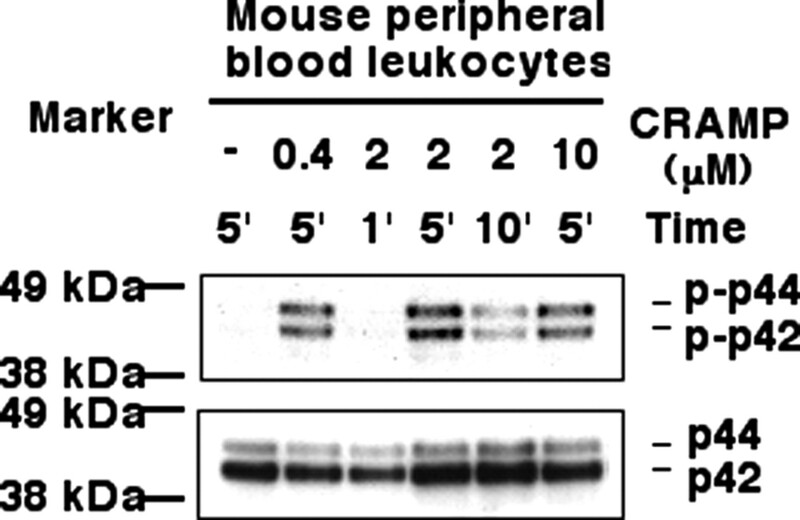 PBS-treated mouse leukocytes display undetectable levels of phosphorylated p42 or p44 ERK (Fig. 3⇓, lane 1, upper panel). Treatment with CRAMP enhanced the levels of phospho-p44/p42 in a dose- (Fig. 3⇓, lanes 2, 4, and 6) and time (lanes 3–5)-dependent manner, with peak activation achieved 5 min after stimulation with 2 μM CRAMP (Fig. 3⇓, upper panel). Probing the same membrane with anti-p44/42 Ab after stripping revealed the amount of p44/42 MAPK loaded on each lane (Fig. 3⇓, lower panel), indicating no significant up-regulation of p44/42 MAPK proteins in response to CRAMP. In addition, CRAMP activated ERK MAPK in human monocytes (data not shown). These results supported the idea that CRAMP might act on leukocytes through a GiαPCR. CRAMP activation of p44/42 MAPK in mouse PBLs. Freshly isolated mouse PBLs were incubated in serum-free RPMI 1640 in the absence or the presence of the indicated concentrations of CRAMP for the specified period of time before lysis. The cell lysates were separated on a 4–12% bis-Tris gel and transferred to a polyvinylidene difluoride membrane, and the phosphorylated p44/42 MAPKs were detected by Western blotting with anti-phospho-p44/42 (top panel). The same membrane was stripped and blotted with anti-p44/42 (bottom panel). The exposure times for the top and bottom autoradiographs were 30 and 15 s, respectively. Shown are the results of one of three representative experiments. To identify the chemotactic receptor for CRAMP, we investigated whether differentiation of monocytes to either DCs or macrophages (Mφ) would affect their responsiveness to CRAMP. Interestingly, monocyte-derived Mφ were still able to migrate chemotactically in response to CRAMP (Fig. 4⇓A), whereas DCs differentiated from the same starting population of monocytes failed to migrate in response to CRAMP (Fig. 4⇓B). The possibility that the failure of monocyte-derived DCs to migrate in response to CRAMP might have resulted from the inability of DCs to migrate was ruled out because the DCs migrated in response to W peptide, a chemoattractant known to be active on DCs (37, 39). Therefore, the GiαPCR used by CRAMP must be a receptor that is functional in monocytes, neutrophils, and monocyte-derived Mφ, but is not functional in DCs derived from monocytes in vitro due to down-regulation of its responsiveness or expression. CRAMP induction of chemotaxis of monocyte-derived Mφ. The chemotaxis of Mφ (A) and iDCs (B) differentiated from monocytes of the same blood donor in response to CRAMP was evaluated by chemotaxis assay. The results are shown as the average cell migration (mean ± SD) of triplicate wells. Similar results were obtained in two separate experiments. Analysis of the expression patterns of all known GiαPCRs based on published reports revealed a potential candidate, FPRL1, which is expressed by monocytes (27, 35, 40), neutrophils (27, 35), and monocyte-derived Mφ (40), but down-regulated on iDCs differentiated in vitro from monocytes (40). Additionally, LL-37, the human cathelicidin, has been shown to use FPRL1 as a receptor (23, 24). Because triggering FPRL1 on phagocytes results not only in chemotaxis, but also in Ca2+ flux (24, 39, 40), we investigated whether the capacity of CRAMP to induce Ca2+ flux in human monocytes could be homologously desensitized by an FPRL1-specific agonistic ligand, MMK-1 (33). As expected, both MMK-1 and CRAMP induced Ca2+ flux in monocytes in a dose-dependent manner (Fig. 5⇓, A and B). In addition, the Ca2+ flux induced by CRAMP at 10 μM was completely desensitized by pretreatment of monocytes with 100 nM MMK-1 (Fig. 5⇓C). Conversely, CRAMP at 10 μM markedly desensitized the Ca2+ flux in response to 5 nM MMK-1 (Fig. 5⇓D). Because homologous cross-desensitization of Ca2+ flux is often due to two agonistic ligands acting on the same receptor, these data suggest that CRAMP indeed uses FPRL1 as a functional receptor. Stimulation and cross-desensitization of Ca2+ flux in monocytes by CRAMP. Ca2+ flux of fura 2-loaded human monocytes in response to MMK-1 (A) and CRAMP (B) was measured by recording the ratio of emission at λ510 after simultaneous excitation at λ340 and λ380. 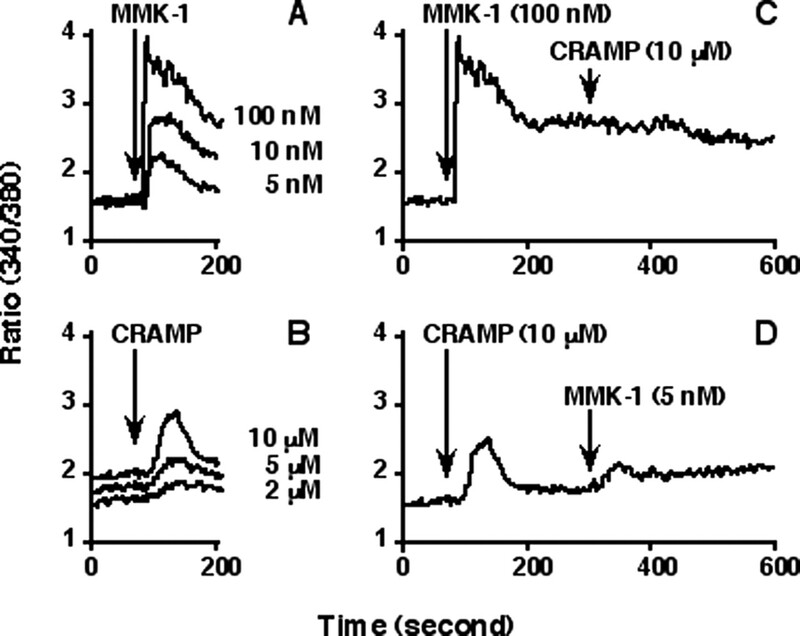 Cross-desensitization of Ca2+ flux was determined by sequential addition of MMK-1 and CRAMP at the indicated concentrations and for the indicated time periods (C) or vice versa (D). To further ensure the use of FPRL1 by CRAMP as a receptor, we examined whether CRAMP could chemoattract HEK293 cells stably transfected to express FPRL1. 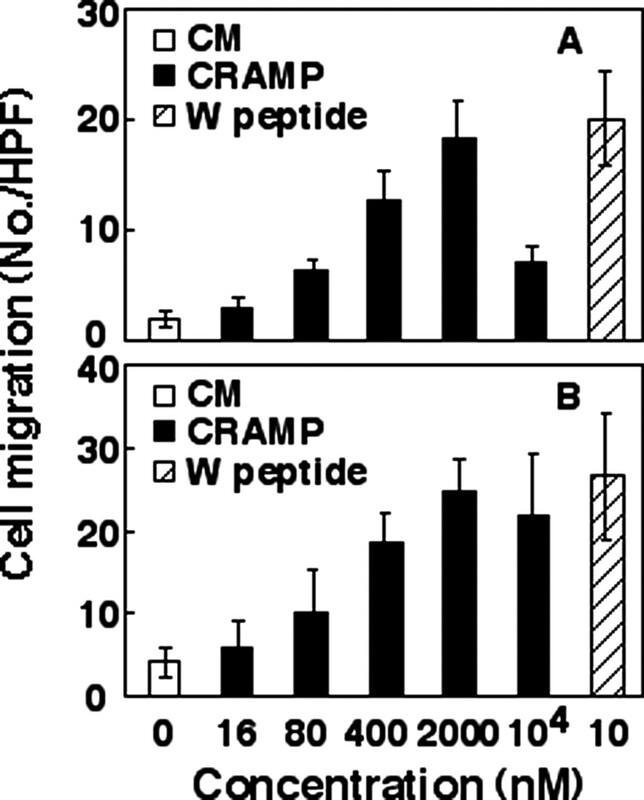 Indeed, CRAMP dose-dependently induced the migration of FPRL1/HEK293 cells (Fig. 6⇓A). 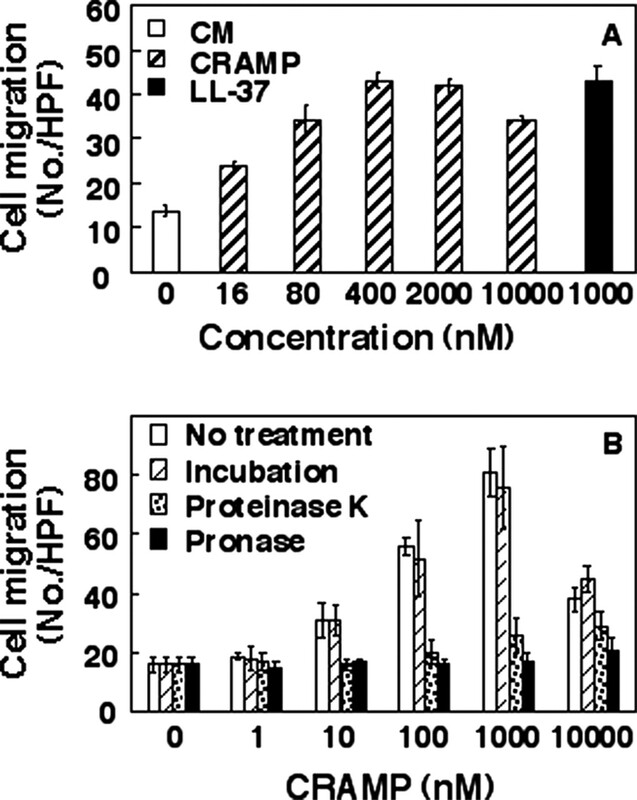 In addition, CRAMP induced chemotaxis of HEK293 stably transfected to express mFPR2 (Fig. 6⇓B), which is the mouse orthologue for human FPRL1 (27, 45, 46). In Fig. 6⇓, A and B, W peptide was used as a positive control because it is an agonistic ligand for both FPRL1 and mFPR2. The parental HEK293 cells or HEK293 stably transfected to express several other GiαPCRs did not migrate in response to CRAMP (data not shown). These results demonstrate that CRAMP acts as an agonistic ligand for FPRL1/mFPR2. CRAMP usage of FPRL1 or mFPR2 to mediate chemotaxis. The migration of FPRL1/HEK293 (A) and mFPR2/HEK293 (B) cells in response to CRAMP or W peptide (positive control) was examined, and the average cell migration (mean ± SD) of triplicate wells was determined. CRAMP did not induce the migration of parental HEK293 cells or HEK293 cells expressing several other chemokine receptors (data not shown). Having established that CRAMP acts as an agonistic ligand for FPRL1/mFPR2, we examined whether CRAMP could recruit leukocytes in vivo by the use of the mouse air pouch model. Injection of 1 ml of CRAMP or LL-37 diluted in LPS-free PBS (final concentration, 2 μM) into the experimentally formed air pouch of mice elevated the recruitment of leukocytes into the air pouch. Dilution of CRAMP to as low as 0.4 μM could induce a significant recruitment of leukocytes into mouse air pouches (Fig. 7⇓B). Based on microscopic morphologies and differential counting, leukocytes recruited into the air pouch by CRAMP consisted predominantly of neutrophils, followed by monocytes and lymphocytes (Fig. 7⇓C). These data demonstrate that CRAMP functions as a leukocyte chemoattractant in vivo. In vivo recruitment of mouse leukocytes by CRAMP. A, One milliliter of endotoxin-free PBS or PBS containing CRAMP or LL-37 (2 μM) was injected into experimentally formed air pouches of BALB/c mice. Four hours later, leukocytes recruited into the pouch were washed out, enumerated, and shown as the average cell number (mean ± SD) per pouch. B, The recruitment of mouse leukocytes into experimentally formed mouse air pouches by different concentrations of CRAMP was examined as described in A. C, The migration of various subpopulations of leukocytes (neutrophils, monocytes, and lymphocytes) into the air pouches of mice in response to various concentrations of CRAMP was determined by differential counting after staining the cytospin slides of recruited leukocytes. In all experiments, three mice per group were used. ∗, p < 0.05; ∗∗, p < 0.001 (compared with PBS injection group, by Mann-Whitney U test). Based on the multiple effects of AMPs on the migration and activation of various leukocytes, it has been proposed that AMPs such as defensins and cathelicidins, in addition to directly acting as innate antimicrobial effectors, may promote the induction of adaptive antimicrobial immune responses (5). Having established that CRAMP, similar to human cathelicidin/LL-37, acts as a chemoattractant and activator for leukocytes provided a basis for studies of experimental mouse model to determine whether cathelicidin has the capacity to enhance Ag-specific immune responses. To this end, B6 mice were immunized i.p. with OVA in the absence or the presence of CRAMP or alum (as a positive control) on day 1 and were boosted by i.p. injection of OVA alone on day 14. On days 10 and 21, the levels of anti-OVA-specific serum IgG were measured as an indicator of primary and secondary OVA-specific humoral immune responses, respectively. In addition, on day 21, the proliferation and cytokine production by mouse splenocytes in response to OVA stimulation were measured to determine the cellular anti-OVA immune response. As expected, immunization of OVA together with alum enhanced anti-OVA IgG Ab responses (Fig. 8⇓A, ▨). Compared with immunization with OVA alone, immunization with OVA plus CRAMP markedly increased the production of OVA-specific serum IgG Ab responses during both primary (day 10) and secondary (day 21) immune responses (Fig. 8⇓A, ▪). CRAMP enhanced the anti-OVA IgG Ab response in a dose-dependent manner, with higher titers of serum anti-OVA IgG Ab induced by 40 than 10 nmol of CRAMP (Fig. 8⇓A). Measurement of the subclass of anti-OVA-specific IgG in the serum samples of immunized mice revealed that the production of OVA-specific IgG1, IgG2a, IgG2b, and IgG3 was enhanced to various degrees by CRAMP (Fig. 8⇓B). Although mice injected with OVA and 40 nmol of CRAMP showed moderate (statistically significant) enhancement of OVA-specific IgG1 during the primary anti-OVA immune response, there was no obvious selective enhancement of either IgG1 or IgG2a during the secondary anti-OVA immune response regardless of the dose of CRAMP administered (Fig. 8⇓B). These data suggest that CRAMP, when administered i.p. together with OVA, enhanced the OVA-specific immune response without polarizing the immune response to either Th1 or Th2 dominance. 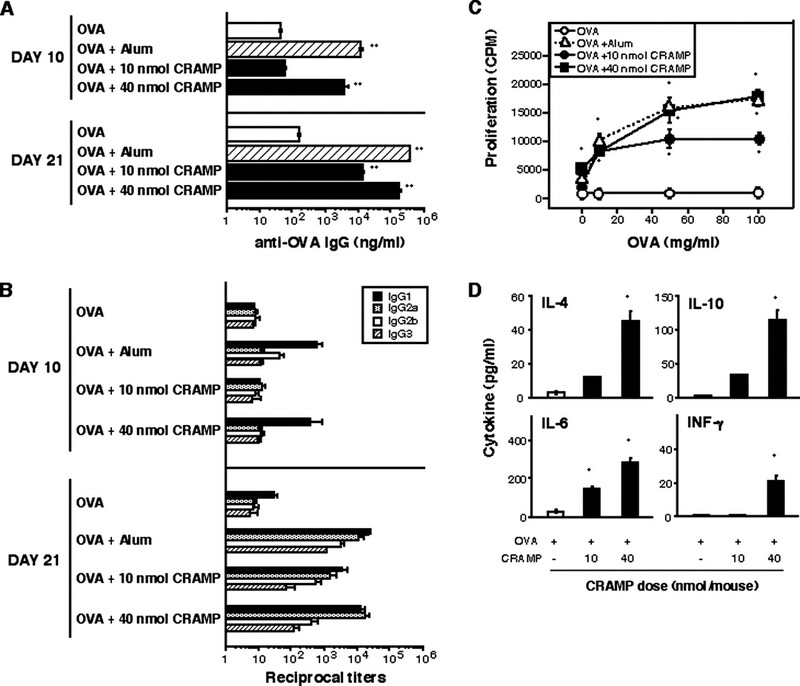 CRAMP enhancement of OVA-specific humoral and cellular immune responses. C57BL/6 mice (female, 8 wk old, n = 5) were i.p. immunized on day 1 with 0.2 ml of PBS containing 50 μg of OVA in the absence or the presence of alum (3 mg) or CRAMP (10 or 40 nmol). On day 14, mice were booster-immunized by i.p. injection of 0.2 ml of PBS containing 50 μg of OVA. Serum samples were collected from each mouse on days 10 and 21, and splenocytes were prepared from each mouse on day 21 after euthanasia. The data from one of three representative experiments are shown. A and B, Total and subclass OVA-specific serum IgG Abs were measured by ELISA as detailed in Materials and Methods. Shown are the average OVA-specific IgG Ab titers (mean ± SEM) of each group. ∗, p < 0.001 (compared with the group immunized with OVA alone, by Mann-Whitney U test). C, Splenocytes of immunized mice were cultured at 105/well in 96-well tissue culture plates in DMEM containing 5% FBS in the presence of OVA at the final concentrations indicated for 72 h at 37°C in humidified air containing 5% CO2 and were pulsed with [3H]TdR (0.5 μCi/well) before harvest and measurement of incorporated radioactivity with a microbeta counter. Each data point is the average (mean ± SEM) [3H]TdR incorporation of five mice, each measured in triplicate. ∗, p < 0.001 (compared with the corresponding point for mice immunized with OVA alone, by Mann-Whitney U test). D, Splenocytes were cultured as described in C in the presence of 50 μg/ml OVA. After 72 h, the supernatant was harvested for the measurement of mouse IL-4, IL-6, IL-10, and IFN-γ. The results are expressed as the average (mean ± SEM) of five mice, each measured in triplicate. ∗, p < 0.001 (compared with the corresponding point for mice immunized with OVA alone, by Mann-Whitney U test). Measurement of OVA-specific splenocyte proliferation by [3H]TdR incorporation demonstrated that splenocytes from mice immunized with OVA plus CRAMP proliferated much more than splenocytes from mice immunized with OVA alone in response to various concentrations of OVA, suggesting that CRAMP also enhanced the OVA-specific cellular immune response (Fig. 8⇑C). The effect of CRAMP on the enhancement of the OVA-specific cellular immune response was dose dependent (Fig. 8⇑C). In addition, splenocytes from mice immunized with OVA plus CRAMP generated much more IL-4, IL-6, IL-10, and IFN-γ in response to the stimulation of 50 μg/ml OVA than did splenocytes from mice immunized with OVA alone (Fig. 8⇑D). This enhancement of cytokine production by simultaneous immunization with CRAMP and OVA was also dose dependent. Because splenocytes from mice immunized with OVA plus CRAMP at 40 nmol produced both IL-4 and IFN-γ in response to OVA stimulation, this supports the conclusion that CRAMP augmented both Th1- and Th2-type Ag-specific immune responses. In this study we have demonstrated that CRAMP, the mature C-terminal antimicrobial peptide of mouse cathelicidin, is a chemotactic activator of mouse and human leukocytes (predominantly neutrophils and monocytes), leading to chemotaxis, Ca2+ flux, and the activation of MAPK of target cells. We have also identified the receptor that CRAMP uses to mediate its effect on leukocytes as FPRL1 in humans and mFPR2 in mice. Experiments using mouse air pouch model have shown that CRAMP as well as its human orthologue, LL-37, can function as chemoattractants in vivo, resulting in the recruitment of mouse leukocytes into the site of injection. Thus, CRAMP and LL-37 function both in vitro and in vivo as agonistic ligands for FPRL1/mFPR2. Most chemokines and chemoattractants show an optimal dose of ≤100 nM for chemoattracting leukocytes (27, 35, 39, 40, 47). 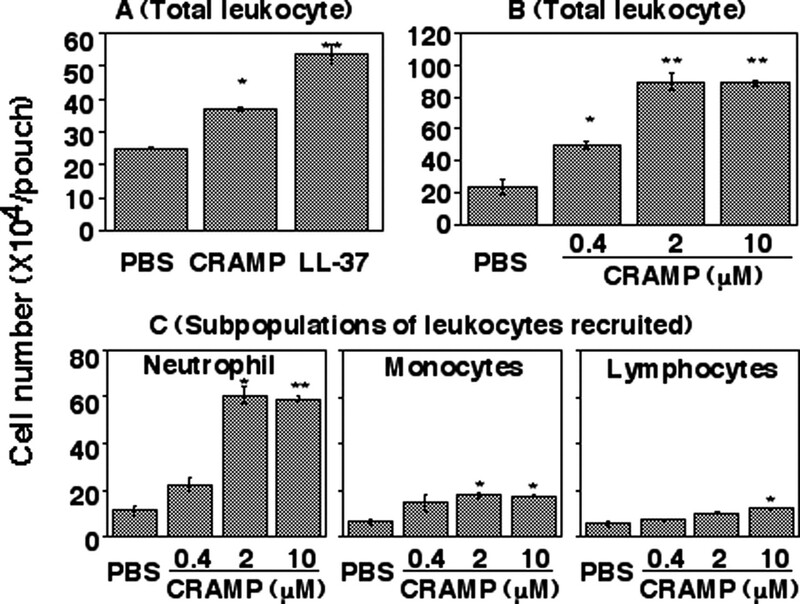 The optimal dose of CRAMP to attract human and mouse leukocytes was ≥400 nM (Figs. 1⇑, 2⇑, 4⇑, and 6⇑). In vivo, maximal recruitment of mouse leukocytes by CRAMP when tested by an air pouch model was ≥2 μM (Fig. 7⇑). This raises the question of whether a cathelicidin, such as CRAMP or LL-37, can reach a level of 2 μM in vivo. CRAMP is expressed by mouse granulocytes and skin keratinocytes, and its expression is up-regulated dramatically during the neonatal period and in response to skin injury or infection (18, 30, 32, 48). Although the expression of CRAMP in vivo has not been quantitatively measured, the expression of human cathelicidin, LL-37, by human airway epithelia in a human-mouse xenograft model has been determined to be 2 μg/ml, equivalent to 0.4 μM (19). The expression of LL-37 by keratinocytes in vitro can increase at both mRNA and protein levels by 10- to 50-fold in response to inflammatory stimuli (15, 49). Assuming that airway infection can also induce a 10- to 50-fold increase in cathelicidin (LL-37 or CRAMP) expression, the concentration of cathelicidin at the site of airway inflammation would reach 4–20 μM, sufficient for either LL-37 or CRAMP to participate in the recruitment of leukocytes to local inflammatory sites. Although we showed that CRAMP was chemotactic for leukocytes in vitro and recruited leukocytes in vivo using a mouse air pouch model, it has been reported that there is no difference in neutrophil infiltration between wild-type and CRAMP knockout mice at the sites of skin bacterial infection (32). The lack of a deficiency in neutrophil recruitment at the skin infection sites of CRAMP knockout mice suggests that other chemoattractants or chemokines might have compensated for the lack of CRAMP in the skin infection model. Bacteria-derived, formylated peptides such as fMLP, complement product such as C5a, and certain chemokines such as IL-8 are all potent neutrophil recruiters (27). Such a scenario is not unique to CRAMP, because knockout of C5a receptor (50) or FPR (51) also did not reduce neutrophil recruitment into sites of bacterial infection. To date, four members of the cathelicidin subfamily, including pig PR-39 (28), bovine ProBac7 (29), human LL-37 (14, 24, 25), and mouse CRAMP (the present study), have been shown to act as leukocyte chemoattractants. Although it remains to be determined whether PR-39 and ProBac7 also act as agonistic ligands for FPRL1/mFPR2-like orthologue receptors in corresponding species, it is tempting to speculate that cathelicidin-derived α-helical AMPs may function as a family of endogenous ligands for FPRL1/mFPR2-type receptors. For example, monkey cathelicidin/RL-37 is highly likely to be an agonist for FPRL1, because it has high homology with human cathelicidin/LL-37 (52) and can be recognized by anti-human cathelicidin/LL-37 Abs (53). In addition to cathelicidins, FPRL1/mFPR2-type receptors have been reported to host structurally diverse ligands ranging from big proteins including serum amyloid A, amyloid β42, a variety of small peptides derived from either host or pathogens, and even lipoxin A4, a lipid metabolite of eicosanoid (27, 35, 36, 46, 54, 55, 56, 57, 58); however, it is not known how these structurally diverse ligands interact with the same FPRL1/mFPR2-type receptor. Activation of FPRL1/mFPR2 by agonistic ligands results in a Gi protein-coupled signaling cascade leading not only to chemotaxis of leukocytes, but also to increased adhesion, enhanced phagocytosis, and release of oxygen intermediates (27, 46, 54). Therefore, cathelicidin has been proposed to have the potential to promote innate and adaptive antimicrobial immunity by recruiting and activating leukocytes at sites of microbial invasion where it is present as a result of constitutive or induced production (4, 5, 6, 7). However, the in vivo evidence for such a role for cathelicidin in the induction of adaptive immune response has been lacking. The finding that mouse cathelicidin, CRAMP, similar to human cathelicidin, LL-37, is capable of inducing leukocyte activation and chemotaxis in vitro and in vivo (Figs. 1–7⇑⇑⇑⇑⇑⇑⇑) enabled us to use mouse experimental models to address this issue. As a first step, we investigated whether CRAMP could enhance Ag-specific immune response to OVA, a commonly used experimental model Ag. The results showing that CRAMP, when simultaneously administered with OVA to B6 mice, dose-dependently enhanced OVA-specific Ab and T cell responses without polarizing the immune response to either Th1 or Th2 dominance, provided the first evidence demonstrating that cathelicidin has the capacity to promote the induction of an adaptive immune response. How does cathelicidin promote Ag-specific antimicrobial immune responses? Cathelicidin is rapidly induced at the site of microbial invasion. The capacity of cathelicidin to promote the recruitment of monocytes (the present study and Refs. 24 and 29) would enhance the uptake, processing, and presentation of Ag because recruited monocytes can differentiate into DCs (the most potent APCs) (59, 60). This process may be facilitated by cathelicidin, because human cathelicidin/LL-37 has been reported to stimulate this differentiation process in vitro by up-regulating the endocytic capacity and surface expression of costimulatory molecules of DCs derived from monocytes (61). Furthermore, cathelicidin may enhance the induction of an adaptive immune response by promoting the production of CCL2/MCP-1 (21), a chemokine capable of recruiting monocytes, Mφ, and DCs, or facilitating the processing of IL-1β (62), an IL capable of enhancing Ag-specific immune responses. Additional investigation is needed to determine the relative contributions of these functional properties of cathelicidin to the enhancement of Ag-specific immune responses. A number of structurally diverse, multifunctional, endogenous mediators of innate host defense, including defensins (63, 64, 65), eosinophil-derived neurotoxin (41, 66), high mobility group box 1 (67), aminoacyl-tRNA synthetases (68, 69), urokinase (70, 71), and ribosomal protein S19 (72), have been proposed to be categorized as endogenous immune alarmins based on the following criteria (66, 73). 1) They are rapidly induced or released in response to danger signals generated by tissue injury or various (viral, bacterial, fungal, or parasitic) forms of infection. 2) They can interact with GiPCRs, resulting in the recruitment of monocytes or DCs. 3) They can activate Ag-presenting leukocytes, such as monocytes or DCs, leading to the production of proinflammatory cytokines and/or maturation of DCs. Because the recruitment and subsequent activation of APCs are pivotal for the initiation of adaptive immune responses, these immune alarmins would contribute to rapid mobilization and activation of the innate and adaptive immune systems in response to danger signals. The demonstration that cathelicidin is capable of recruiting and activating APCs and enhancing Ag-specific immune responses (the present study and Refs. 24 and 61) indicates that cathelicidin is also an immune alarmin. We thank Dr. Ji Ming Wang (National Cancer Institute, National Institutes of Health) for sharing the mFPR2/HEK293 cell line, and Drs. O. M. Zack Howard (National Cancer Institute, National Institutes of Health) and Alan Sher (National Institute of Arthritis and Infectious Diseases, National Institutes of Health) for valuable consultation and discussion. ↵1 This work was supported in part by federal funds from the National Cancer Institute, National Institutes of Health, under Contract NO1-CO-12400. K.K. is supported in part by the Japan Society for the Promotion of Science, Program of Oversea Research Fellowships for Japanese Biomedical and Behavioral Researchers. The content of this publication does not necessarily reflect the views or policies of the Department of Health and Human Services, nor does mention of trade names, commercial products, or organizations imply endorsement by the U.S. government. The publisher or recipient acknowledges the right of the U.S. government to retain a nonexclusive, royalty-free license in and to any copyright covering the article. ↵3 Abbreviations used in this paper: AMP, antimicrobial protein; CRAMP, cathelin-related antimicrobial peptide; DC, dendritic cell; FPR, formyl peptide receptor; FPRL, FPR-like-1; GiαPCR, Giα protein-coupled receptor; hCAP18, human cationic antimicrobial protein of 18 kDa; HEK, human embryonic kidney; iDC, immature DC; Mφ, macrophage; mFPR2, mouse formyl peptide receptor-2; PTX, pertussis toxin; rh, recombinant human. Ganz, T., R. I. Lehrer. 1997. Antimicrobial peptides of leukocytes. Curr. Opin. Hematol. 4: 53-58. Boman, H. G.. 2003. Antibacterial peptides: basic facts and emerging concepts. J. Intern. Med. 254: 197-215. Zanetti, M., R. Gennaro, D. Romeo. 1995. Cathelicidins: a novel protein family with a common proregion and a variable C-terminal antimicrobial domain. FEBS Lett. 374: 1-5. Lehrer, R. I., T. Ganz. 2002. Defensins of vertebrate animals. Curr. Opin. Immunol. 14: 96-102. Yang, D., A. Biragyn, L. W. Kwak, J. J. Oppenheim. 2002. Mammalian defensins in immunity: more than just microbicidal. Trends Immunol. 23: 291-296. Zasloff, M.. 2002. Antimicrobial peptides of multicellular organisms. Nature 415: 389-395. Bals, R., J. M. Wilson. 2003. Cathelicidins-a family of multifunctional antimicrobial peptides. Cell. Mol. Life Sci. 60: 711-720. Larrick, J. W., M. Hirata, H. Zheng, J. Zhong, D. Bolin, J.-M. Cavaillon, H. S. Warren, S. C. Wright. 1994. A novel granulocyte-derived peptide with lipopolysaccharide-neutralizing activity. J. Immunol. 152: 231-240. Cowland, J. B., A. H. Johnsen, N. Borregaad. 1995. hCAP-18, a cathelin/pro-bactenecin-like protein of human neutrophil specific granules. FEBS Lett. 368: 173-176. Agerberth, B., H. Gunne, J. Odeberg, P. kogner, H. G. Boman, G. H. Gudmundsson. 1995. FALL-39, a putative human peptide antibiotic, is cysteine-free and expressed in bone marrow and testis. Proc. Natl. Acad. Sci. USA 92: 195-199. Gudmundsson, G. H., B. Agerberth, J. Odeberg, T. Bergman, B. Olsson, R. Salcedo. 1996. The human gene FALL-39 and processing of the cathelin precursor to the antibacterial peptide LL-37 in granulocytes. Eur. J. Biochem. 238: 325-332. Sorensen, O. E., P. Follin, A. H. Johnsen, J. Calafat, G. S. Tjabringa, P. S. Hiemstra, N. Borregaad. 2001. Human cathelicidin, hCAP-18, is processed to the antimicrobial peptide LL-37 by extracellular cleavage with proteinase 3. Blood 97: 3951-3959. Bals, R., X. Wang, M. Zasloff, J. M. Wilson. 1998. The peptide antibiotic LL-37/hCAP-18 is expressed in epithelia of the human lung where it has broad anti-microbial activity at the airway surface. Proc. Natl. Acad. Sci. USA 95: 9541-9546. Agerberth, B., J. Charo, J. Werr, B. Olsson, F. Idali, L. Lindbom, R. Kiessling, H. Jomvall, H. Wigzell, G. H. Gudmundsson. 2000. The human antimicrobial and chemotactic peptides LL-37 and α-defensins are expressed by specific lymphocyte and monocyte populations. Blood 96: 3086-3093. Frohm, M., B. Agerberth, G. Ahangari, M. Stahle-Backdahl, S. Liden, H. Wigzell, G. H. Gudmundsson. 1997. The expression of the gene coding for the antimicrobial peptide LL-37 is induced in human keratinocytes during inflammatory disorders. J. Biol. Chem. 272: 15258-15263. Di Nardo, A., A. Vitiello, R. L. Gallo. 2003. Cutting Edge: mast cell antimicrobial activity is mediated by expression of cathelicidin antimicrobial peptide. J. Immunol. 170: 2274-2278. Sorensen, O., J. B. Cowland, J. Askaa, N. Borregaad. 1997. An ELISA for hCAP-18, the cathelicidin present in human neutrophils and plasma. J. Immunol. Methods 206: 53-59. Dorschner, R. A., V. K. Pestonjamasp, S. Tamakuwala, T. Ohtake, J. Rudisill, V. Nizet, B. Agerberth, G. H. Gudmundsson, R. L. Gallo. 2001. Cutaneous injury induces the release of cathelicidin anti-microbial peptides active against group A streptococcus. J. Invest. Dermatol. 117: 91-97. Bals, R., D. J. Weiner, R. L. Meegalla, J. M. Wilson. 1999. Transfer of a cathelicidin peptide antibiotic gene restores bacterial killing in a cystic fibrosis xenograft model. J. Clin. Invest. 103: 1113-1117. Kirikae, T., M. Hirata, H. Yamasu, F. Kirikae, H. Tamura, F. Kayama, K. Nakatsuka, T. Yokochi, M. Nakano. 1998. Protective effects of a human 18-kilodalton cationic antimicrobial protein (CAP18)-derived peptide against murine endotoxemia. Infect. Immun. 66: 1861-1868. Scott, M. G., D. J. Davidson, M. R. Gold, D. Bowdish, R. E. W. Hancock. 2002. The human antimicrobial peptide LL-37 is a multifunctional modulator of innate immune response. J. Immunol. 169: 3883-3891. Niyonsaba, F., A. Someya, M. Hirata, H. Ogawa, I. Nagaoka. 2001. Evaluation of the effects of peptide antibiotics human β-defensin-1/2 and LL-37 on histamine release and prostaglandin D2 production from mast cells. Eur. J. Immunol. 31: 1066-1075. Koczulla, R., G. von Degenfeld, C. Kupatt, F. Krotz, S. Zahler, T. Gloe, K. Issbrucker, P. Unterberger, M. Zaiou, C. Lebherz, et al 2003. An angiogenic role for the human peptide antibiotic LL-37/hCAP-18. J. Clin. Invest 111: 1665-1672. Yang, D., Q. Chen, A. P. Schmidt, G. M. Anderson, J. M. Wang, J. Wooters, J. J. Oppenheim, O. Chertov. 2000. LL-37, the neutrophil granule- and epithelial cell-derived cathelicidin, utilizes formyl peptide receptor-like 1 (FPRL1) as a receptor to chemoattract human peripheral blood neutrophils, monocytes, and T cells. J. Exp. Med. 192: 1069-1074. Heilborn, J. D., M. F. Nilsson, G. Kratz, G. Weber, O. Sorensen, N. Borregaard, M. Stahle-Backdahl. 2003. The cathelicidin anti-microbial peptide LL-37 is involved in re-epithelialization of human skin wounds and is lacking in chronic ulcer epithelium. J. Invest. Dermatol. 120: 379-389. Murphy, P. M.. 1994. The molecular biology of leukocyte chemoattractant receptors. Annu. Rev. Immunol. 12: 593-633. Huang, H. J., C. R. Ross, F. Blecha. 1997. Chemoattractant properties of PR-39, a neutrophil antibacterial peptide. J. Leukocyte Biol. 61: 624-629. Verbanac, D., M. Zanetti, D. Romeo. 1993. Chemotactic and protease-inhibiting activities of antibiotic peptide precursors. FEBS Lett. 371: 255-258. Gallo, R. L., K. J. Kim, M. Bernfield, C. A. Kozak, M. Zanetti, L. Merluzzi, R. Gennaro. 1997. Identification of CRAMP, a cathelin-related antimicrobial peptide expressed in the embryonic and adult mouse. J. Biol. Chem. 272: 13088-13093. Yu, K., K. Park, Y. Kim, S.-W. Kang, S. Y. Shin, K.-S. Hahm. 2002. Solution structure of a cathelicidin-derived antimicrobial peptide, CRAMP as determined by NMR spectroscopy. J. Pept. Res. 60: 1-9. Nizet, V., T. Ohtake, X. Lauth, J. Trowbridge, J. Rudisill, R. A. Dorschner, V. Pestonjamasp, J. Piraino, K. Huttner, R. L. Gallo. 2001. Innate antimicrobial peptide protects the skin from invasive bacterial infection. Nature 414: 454-457. Klein, C., J. I. Paul, K. Sauve, K. Schmidt, M. M. Arcangeli, J. Ransom, J. Trueheart, J. P. Manfredi, J. R. Broach, A. J. Murphy. 1998. Identification of surrogate agonists for human FPRL-1 receptor by autocrine selection in yeast. Nat. Biotechnol. 16: 1334-1337. Baek, S. H., J. K. Seo, C. B. Chae, P. G. Suh, S. H. Ryu. 1996. Identification of the peptides that stimulate the phosphoinositide hydrolysis in lymphocyte cell lines from peptide libraries. J. Biol. Chem. 271: 8170-8175. Le, Y., W.-h. Gong, B. Li, N. M. Dunlop, W. Shen, S. B. Su, R. D. Ye, J. M. Wang. 1999. Utilization of two seven-transmembrane, G protein-coupled receptors, formyl peptide receptor-like 1 and formyl peptide receptor, by the synthetic hexapeptide WKYMVm for human phagocyte activation. J. Immunol. 163: 6777-6784. Christophe, T., A. Karlsson, C. Dugave, M. J. Rabiet, F. Boulay, C. Dahlgren. 2001. The synthetic peptide Trp-Lys-Tyr-Met-Val-Met-NH2 specifically activates neutrophils through FPRL1/lipoxin A4 receptors and is an agonist for the orphan monocyte-expressed chemoattractant receptor FPRL2. J. Biol. Chem. 276: 21585-21593. Yang, D., Q. Chen, B. Gertz, R. He, M. Phulsuksombati, R. D. Ye, J. J. Oppenheim. 2002. Human dendritic cells express functional formyl peptide receptor-like-2 (FPRL2) throughout maturation. J. Leukocyte Biol. 72: 598-607. Yamashiro, S., J. M. Wang, D. Yang, W. H. Gong, H. Kamohara, T. Yoshimura. 2000. Expression of CCR6 and CD83 by cytokine-activated human neutrophils. Blood 96: 3958-3963. Yang, D., Q. Chen, S. Stoll, X. Chen, O. M. Z. Howard, J. J. Oppenheim. 2000. Differential regulation of responsiveness to fMLP and C5a upon dendritic cell maturation: Correlation with receptor expression. J. Immunol. 165: 2694-2702. Yang, D., Q. Chen, Y. Le, J. M. Wang, J. J. Oppenheim. 2001. Differential regulation of formyl peptide receptor-like 1 expression during the differentiation of monocytes to dendritic cells and macrophages. J. Immunol. 166: 4092-4098. Yang, D., H. F. Rosenberg, Q. Chen, K. D. Dyer, K. Kurosaka, J. J. Oppenheim. 2003. Eosinophil-derived neurotoxin (EDN), an antimicrobial protein with chemotactic activities for dendritic cells. Blood 102: 3396-3403. Kaslow, H. R., D. L. Burns. 1992. Pertussis toxin and target eukaryotic cells: binding, entry, and activation. FASEB J. 6: 2684-2690. Majka, M., J. Ratajczak, M. A. Kowalska, M. Z. Ratajczak. 2000. Binding of stromal derived factor-1α (SDF-1α) to CXCR4 chemokine receptor in normal human megakaryoblasts but not in platelets induces phosphorylation of mitogen-activated protein kinase p42/44 (MAPK), ELK-1 transcription factor and serine/threonine kinase AKT. Eur. J. Haematol. 64: 164-172. Sodhi, A., S. K. Biswas. 2002. Monocyte chemoattractant protein-1-induced activation of p42/44 MAPK and c-Jun in murine peritoneal macrophages: a potential pathway for macrophage activation. J. Interferon Cytokine Res. 22: 517-526. Gao, J.-L., H. Chen, J. D. Filie, C. A. Kozak, P. M. Murphy. 1998. Differential expansion of the N-formylpeptide receptor gene cluster in human and mouse. Genomics 51: 270-276. Le, Y., J. J. Oppenheim, J. M. Wang. 2001. Pleiotropic roles of formyl peptide receptors. Cytokine Growth Factor Rev. 12: 91-105. Cui, Y.-H., Y. Le, W. Gong, P. Proost, J. Van Damme, W. J. Murphy, J. M. Wang. 2002. Bacterial lipopolysaccharide selectively up-regulates the function of the chemotactic peptide receptor formyl peptide receptor 2 in murine microglial cells. J. Immunol. 168: 434-442. Dorschner, R. A., K. H. Lin, M. Murakami, R. L. Gallo. 2003. Neonatal skin in mice and humans expresses increased levels of antimicrobial peptides: innate immunity during development of the adaptive response. Pediatr. Res. 53: 566-572. Nilsson, M. F., B. Sandstedt, O. Sorensen, G. Weber, N. Borregaad, M. Stahle-Backdahl. 1999. The human cationic antimicrobial protein (hCAP18), a peptide antibiotic, is widely expressed in human squamous epithelia and colocalizes with interleukin-6. Infect. Immun. 67: 2561-2566. Hopken, U. E., B. Lu, N. P. Gerard, C. Gerard. 1996. The C5a chemoattactant receptor mediates mucosal defense to infection. Nature 383: 86-89. Gao, J.-L., E. J. Lee, P. M. Murphy. 1999. Impaired antibacterial host defense in mice lacking the N-formylpeptide receptor. J. Exp. Med. 189: 657-662. Zhao, C., T. Nguyen, L. M. Boo, T. Hong, C. Espiritu, D. Orlov, W. Wang, A. Waring, R. I. Lehrer. 2001. RL-37, an α-helical antimicrobial peptide of the rhesus monkey. Antimicrob. Agents Chemother. 45: 2695-2702. Bals, R., C. Lang, D. J. Weiner, C. Vogelmeier, U. Welsch, J. M. Wilson. 2001. Rhesus monkey (Macaca mulatta) mucosal antimicrobial peptides are close homologues of human molecules. Clin. Diagn. Lab. Immunol. 8: 370-375. Tiffany, H. L., M. C. Lavigne, Y.-H. Cui, J.-M. Wang, T. L. Leto, J.-L. Gao, P. M. Murphy. 2001. Amyloid-β induces chemotaxis and oxidant stress by acting at formylpeptide receptor 2, a G protein-coupled receptor expressed in phagocytes and brain. J. Biol. Chem. 276: 23645-23652. Chen, Q., D. Wade, K. Kurosaka, Z. Y. Wang, J. J. Oppenheim, D. Yang. 2004. Temporin A and related frog antimicrobial peptides use formyl peptide receptor-like 1 as a receptor to chemoattract phagocytes. J. Immunol. 173: 2652-2659. Fiore, S., J. F. Maddox, H. D. Peres, C. N. Serhan. 1994. Identification of a human cDNA encoding a functional high affinity lipoxin A4 receptor. J. Exp. Med. 180: 253-260. Devchand, P. R., M. Arita, S. Hong, G. Bannenberg, R. L. Moussignac, K. Gronert, C. N. Serhan. 2003. Human ALX receptor regulates neutrophil recruitment in transgenic mice: roles in inflammation and host defense. FASEB J. 17: 652-659. Chiang, N., I. M. Fierroa, K. Gronerta, C. N. Serhana. 2000. Activation of Lipoxin A4 receptors by aspirin-triggered lipoxins and select peptides evokes ligand-specific responses in inflammation. J. Exp. Med. 191: 1197-1208. Randolph, G. J., S. Beaulieu, S. Lebecque, R. M. Steinman, W. A. Muller. 1998. Differentiation of monocytes into dendritic cells in a model of transendothelial trafficking. Science 282: 480-483. Randolph, G. J., K. Inaba, D. F. Robbiani, R. M. Steinman, W. A. Muller. 1999. Differentiation of phagocytic monocytes into lymph node dendritic cells in vivo. Immunity 11: 753-761. Davidson, D. J., A. J. Currie, G. S. Reid, D. M. Bowdish, K. L. MacDonald, R. C. Ma, R. E. Hancock, D. P. Speert. 2004. The cationic antimicrobial peptide LL-37 modulates dendritic cell differentiation and dendritic cell-induced T cell polarization. J. Immunol. 172: 1146-1156. Yang, D., Q. Chen, O. Chertov, J. J. Oppenheim. 2000. Human neutrophil defensins selectively chemoattract naive T and immature dendritic cells. J. Leukocyte Biol. 68: 9-14. Yang, D., O. Chertov, S. N. Bykovskaia, Q. Chen, M. J. Buffo, J. Shogan, M. Anderson, J. M. Schroder, J. M. Wang, O. M. Z. Howard, et al 1999. β-Defensins: Linking innate and adaptive immunity through dendritic and T cell CCR6. Science 286: 525-528. Biragyn, A., M. Surenhu, D. Yang, P. A. Ruffini, B. A. Haines, E. Klyushnenkova, J. J. Oppenheim, L. W. Kwak. 2001. Mediators of innate immunity that target immature, but not mature, dendritic cells induce antitumor immunity when genetically fused with nonimmunogenic tumor antigens. J. Immunol. 167: 6644-6653. Yang, D., Q. Chen, H. F. Rosenberg, S. M. Rybak, D. L. Newton, Z. Y. Wang, Q. Fu, V. T. Tchernev, M. Wang, B. Schweitzer, et al 2004. Human ribonuclease A superfamily members, eosinophil-derived neurotoxin and pancreatic ribonuclease, induce dendritic cell maturation and activation. J. Immunol. 173: 6134-6142. Andersson, U., H. Erlandsson-Harris, H. Yang, K. J. Tracey. 2002. HMGB1 as a DNA-binding cytokine. J. Leukocyte Biol. 72: 1084-1091. Wakasugi, K., P. Schimmel. 1999. Two distinct cytokines released from a human aminoacyl-tRNA synthetase. Science 284: 147-151. Howard, O. M. Z., H. F. Dong, D. Yang, N. Raben, K. Nagaraju, A. Rosen, L. Casciola-Rosen, M. Hartlein, M. Kron, D. Yang, et al 2002. Histidyl-tRNA synthetase and asparaginyl-tRNA synthetase, autoantigens in myositis, activate chemokine receptors on T lymphocytes and immature dendritic cells. J. Exp. Med. 196: 781-791. Blasi, F.. 1999. The urokinase receptor: a cell surface, regulated chemokine. APMIS 107: 96-101. Resnati, M., I. Pallavicini, J. M. Wang, J. Oppenheim, C. N. Serhan, M. Romano, F. Blasi. 2002. The fibrinolytic receptor for urokinase activates the G protein-coupled chemotactic receptor FPRL1/LXA4R. Proc. Natl. Acad. Sci. USA 99: 1359-1364. Shibuya, Y., M. Shiokawa, H. Nishiura, T. Nishimura, N. Nishino, H. Okabe, K. Takagi, T. Yamamoto. 2001. Identification of receptor-binding sites of monocyte chemotactic S19 ribosomal protein dimer. Am. J. Pathol. 159: 2293-2301. Yang, D., J. J. Oppenheim. 2004. Antimicrobial proteins act as “alarmins” in joint immune defense. Arthritis Rheum. 50: 3401-3403.